TL;DR: Extend the DROW dataset to persons, extend the method to include short temporal context, and extensively benchmark all available methods. Detecting humans is a key skill for mobile robots and intelligent vehicles in a large variety of applications. While the problem is well studied for certain sensory modalities such as image data, few works exist that address this detection task using 2D range data. However, a widespread sensory setup for many mobile robots in service and domestic applications contains a horizontally mounted 2D laser scanner. Detecting people from 2D range data is challenging due to the speed and dynamics of human leg motion and the high levels of occlusion and self-occlusion particularly in crowds of people. While previous approaches mostly relied on handcrafted features, we recently developed the deep learning based wheelchair and walker detector DROW. In this paper, we show the generalization to people, including small modifications that significantly boost DROW's performance. Additionally, by providing a small, fully online temporal window in our network, we further boost our score. 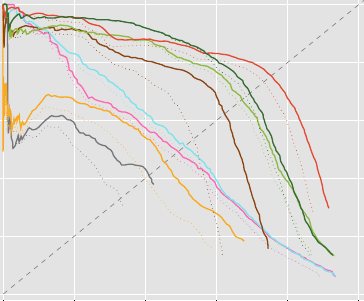 We extend the DROW dataset with person annotations, making this the largest dataset of person annotations in 2D range data, recorded during several days in a real-world environment with high diversity. Extensive experiments with three current baseline methods indicate it is a challenging dataset, on which our improved DROW detector beats the current state-of-the-art.